Well hello and welcome back to the WDW-Memories Podcast where together we relive that Walt Disney World Magic. My name is Lou and I'll once again be your host on this magical adventure. We've got a favorite attraction from my childhood, and one filled with many memories for me. 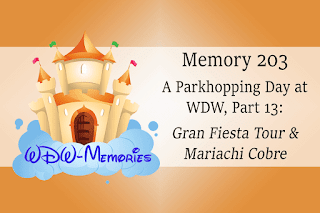 The Gran Fiesta Tour Starring The Three Caballeros has been a favorite of mine, going back to the original El Rio del Tiempo that my brother, sister, and I rode while my parents paid for lunch in the San Angel Inn. Now the 3 Caballeros have taken over and made it their own, still showcasing the diversity of Mexico, but in a fun and entertaining way. We'll pick up the memory well after we have exited Test Track. We've already begun making our way around the Promenade and will join up just as we are entering the Pyramid. We'll enter the queue (the kids will decide to run through the whole thing for some reason), while Traci and I are looking at the Food & Wine festival brochure to find a frozen treat for afterwards. When it's our turn, we've got the front row of the boat. As it pulls away, you'll hear Traci ask if they care if she puts her feet up on the front bow of the boat, it's so nice to stretch out in the air-conditioning. 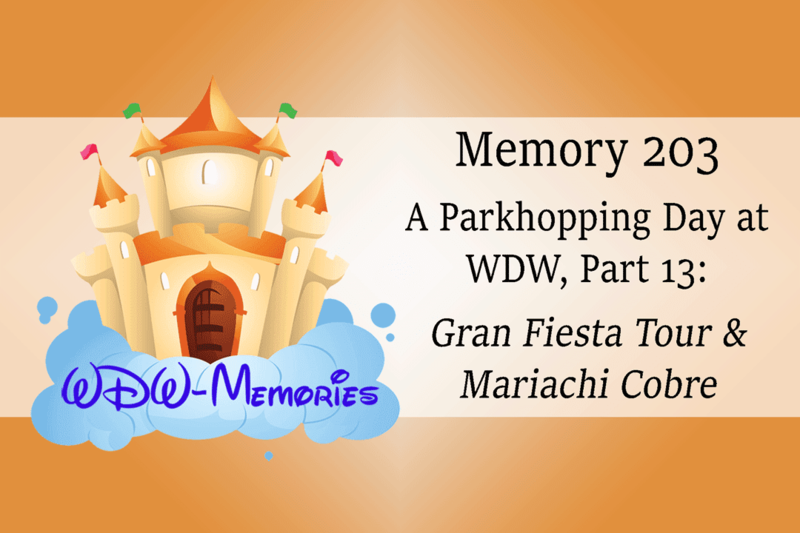 As the boat returns, we'll gather our belongings and head back outside into the heat, and bump into the Mariachi Cobre, who is performing out beside the gift shop area. We'll stop to hear a bit of the music, before deciding it was just too hot in the sun with no shady spots, and continue on our way to the American Adventure in hopes of seeing the Voices of Liberty. Now enjoy a ride on one of my favorite ways to beat the midday heat in Epcot, a dark, air conditioned boat ride through the beauty and charm of Mexico.